Early diagnosis is the best way to set yourself up for successful treatment. When cancers are smaller, they are usually easier to treat. Early treatment tends to be less invasive, healing is expected to be faster, and there is a lower chance of the cancer returning. Early detection makes a big difference in a successful outcome. Extremely safe VELscope technology uses imaging methods to identify precise areas of abnormal, precancerous and cancerous tissue. The VELscope appliance can even pick up areas that are not visible during a thorough clinical exam. Dr. Sekhon feels strongly that every patient receives a cancer screening. 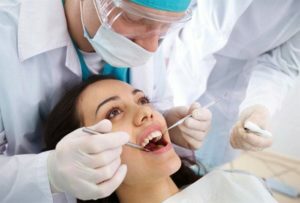 Here at Gallery Dental, we believe that the health of your smile depends on more than nice teeth. We recommend regular oral cancer screenings to ensure that your mouth stays healthy in addition to having a beautiful smile. We also offer wisdom tooth treatments. If you’ve never had an oral cancer screening or don’t remember the last time you had one, then it’s time for you to call our Edmonton, AB dental office today. Don’t wait until it’s too late! Come in for a thorough comprehensive examination and oral cancer screening. All treatment is provided by a general dentist. For more complex cases, we often refer our patients to a specialist for treatment.